This lovely 32-page commemorative booklet was put together by a special committee of the SMC Board of Directors for our historical 100th anniversary celebration. “Our First 100 Years” is a lovely 32-page commemorative booklet which was put together by a special committee of the SMC Board of Directors for our historical 100th anniversary celebration. 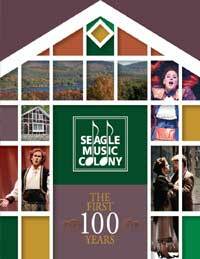 The publication is filled with historical information, an overview of the current state of Seagle Music Colony, a look to our next century as well as many, many photos of notable figures in SMC’s history as well as production photos from across the last century. Make sure to get your copy today and pick up an extra to make a wonderful gift.